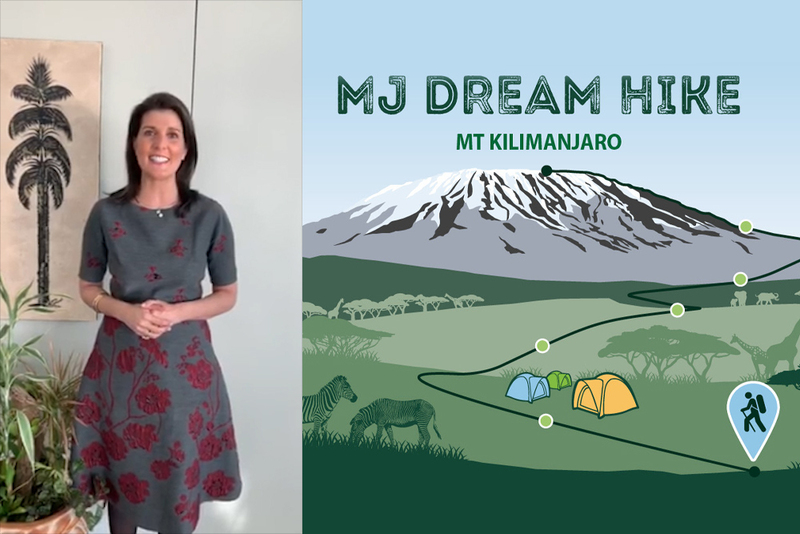 In a video greeting to the hikers ascending Kilimanjaro in the memory of Michael J. Sharp ‘05, former U.S. Ambassador to the United Nations Nikki R. Haley offered both greetings and encouragement. View Nikki Haley’s video greeting. She never met the slain U.N. armed group expert, but grew familiar with his work and his vision for a peaceful Democratic Republic of the Congo while advocating for investigations into his murder. Sharp was killed on March 12, 2017, with colleague Zaida Catalán by unknown assailants. Twelve hikers, including Michael’s father John Sharp and a Congelese colleague Serge Lungele, are making the journey to scatter some of Sharp’s ashes, while also raising funds for a scholarship at Eastern Mennonite University in his name. Visit emu.edu/dream-hike to contribute today. The fundraiser-trek has earned the attention of Nobel Peace Prize recipients Dr. Denis Mukwege and Leymah Gbowee MA ’07, as well as actor and activist Jane Fonda, among others. The first recipient of the Michael J. Sharp Peace and Justice Endowed Scholarship, Congolese peacebuilder David Nyiringabo, began his graduate studies in conflict transformation at the Center for Justice and Peacebuilding in fall 2018. In the video, Haley lauds Sharp’s unceasing and persistent work in rooting out corruption and human rights abuses, and urges viewers to donate to the scholarship so that Sharp’s dream and legacy can continue. John and Michelle Sharp, Michael’s parents, met with Haley several times. In June 2017, Haley advocated to the secretary-general of the UN for a special investigation into their deaths. Though she commended the results of the August 2017 report as “a first step,” she urged a more full investigation. Evidence uncovered during independent efforts by journalists, including a Swedish documentary, suggests the Congolese government was partially responsible. A colonel in the Congolese army was arrested in December 2018.